The latest numbers from market research firm IDC's Worldwide Quarterly Tablet Tracker reveal that Apple continues to be the largest vendor in a declining tablet market, shipping 12.6 million iPads in the first quarter of 2015 to capture a 26.8% share of the global tablet market. 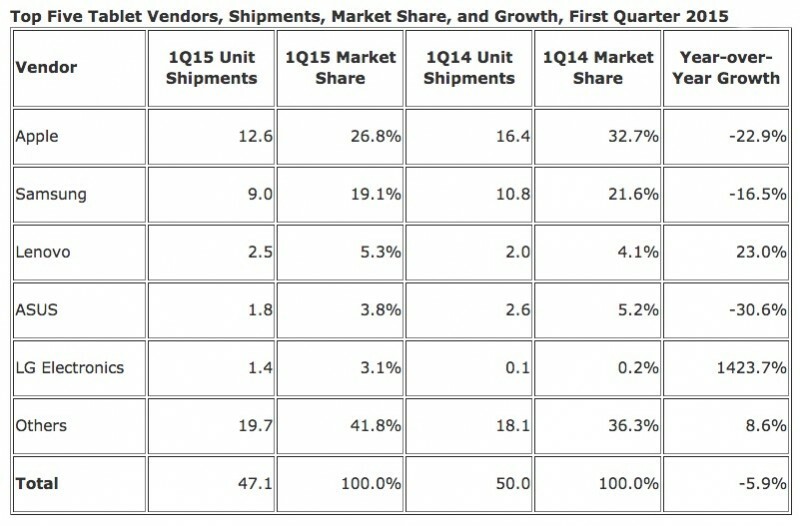 Apple maintained the top position despite facing a 22.9% decline in tablet shipments compared to the year-ago quarter. Samsung was the second largest tablet vendor with 9 million tablet shipments in the first quarter, good for 19.1% market share in the global tablet market and a 16.5% year-over-year decline. Lenovo, Asus and LG Electronics rounded off the top five, with 2.5 million, 1.8 million and 1.4 million global tablet shipments in the first quarter respectively for a combined 12.2% market share. Apple, Samsung and several other electronics makers are feeling the effects of a prolonged slowdown in the tablet market, with the iPad declining in annual growth for five consecutive quarters and competing tablets experiencing similar trends. The launch of the larger iPhone 6 and iPhone 6 Plus and lack of major updates to the iPad lineup since 2013 are likely contributing factors to falling iPad sales over the past few years, while consumers also upgrade their tablets less often than smartphones. Apple CEO Tim Cook, during the company's recent earnings call, said he believes that continued investments in the company's product pipeline and shift to the enterprise market will help the iPad be an "extremely good business over the long-term," although he stopped short of providing a forward-looking statement about when iPad sales could begin growing again. "And so my belief is, that as the inventory plays out, as we make some continued investments in our product pipeline, which we're doing, that we already had planned and have had planned for some time," said Cook. "Between that, the inventory playing out, the enterprise starting to take over, I think still, i believe the iPad is an extremely good business over the long-term. When precisely it begins to grow again I wouldn't want to predict, but I strongly believe that it will." Strategy Analytics shared smartphone data for the first quarter on Wednesday. You need a keyboard and you need a good way to shuttle files between programs. If you're going to do actual work. iOS is built to be idiot-proof and malware-proof, but unfortunately that makes it pretty work-proof for a lot of purposes. iPad's hardware is great & matured but it's software has not. iOS on iPad needs updated in a lot of ways (ex. Why does a folder only show 9 icons on the iPads 9.7" screen). It feels like Apple has put iPad's version of iOS on cruise-control. I refuse to believe this is anything other than tablets don't get replaced very often. From what I've seen in just daily observations, people use their tablets like crazy. I see mostly iPads, but also Kindle Fires, e reader Kindles, and even a few Android tablets ALL OVER THE PLACE. The last time we went out to Red Robin for dinner, I saw at least three families with iPads. Is it obnoxious to bring a tablet to dinner? Yes. But people do love these things, and use them all the time. I don't think this declining sales story necessarily paints the whole picture. However, I will admit that ever since getting my iPhone 6, my iPad usage has declined. If I was going to have a tablet, I would have an iPad. I've had three, but replaced them with an MacBook Air 11". It does everything the iPad can't and I use it all the same places. I got over the non-retina in about a week. 1. Reading on my mac vs in bed on my iPad is a completely different experience. I much, much prefer using my iPad. 2. During Lunch breaks, its so much easier to read on my iPad as opposed to my computer. 3. GAMES! The range of games on iPad far surpass that on my mac. 4. Walking and working. When I took a tour of a building we were thinking of renting, it was much easier to use my iPad to see my notes/questions, pull up the floor plan, take pictures of the space, etc. For non-business work, I use my iPad about 90% of the time compared to my Macbook Air. That said, I'm still on iPad 2!!!! Nothing has made me upgrade yet. I wonder how much of the market share for Lenovo is made up of real tablets and not Windows 8.1 PCs in tablet form. And I wonder what effect (if any) Windows 10 will have on the market. If MS can truly deliver the same OS across multiple platforms, that might become a very attractive ecosystem. LOTS of products "just last", but you don't see 25% declines quarter after quarter. The tablet market is cratering. There's no two ways around that. It's saturated, there's no real need to constantly upgrade. It will stabilize and be consistent at some point. Good point. I hope that the minds at Apple can add "power features" to iPad (in a way that won't affect it negatively of course). For example, I was working on Garageband making a song and writing lyrics/ideas in a Pages document; on my Mac, I would put both those file in one folder called "Song A" - that way it's better organized & has all that project's files in one spot. Can't do that on an iPad - it's messy & I have to remember what apps created which document etc. There has to be an efficient way of doing this on an iPad. I've owned 3 iPads - a 2, 3 and now Air 2. The iPad 2 went to my sister when the 3 came out - couldn't get over the lack of retina once I'd got my iPhone4 - and now I've updated to my Air 2 my sister has my 3 and the 2 is still going strong with one of her friends. My mum has an original iPad mini and is showing no signs of wanting to update it as it still works perfectly for her needs.